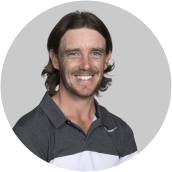 Tommy Fleetwood, pictured below, defied brutally-tough conditions to get within a shot of the lead at the halfway stage of the US PGA Tour's Honda Classic at Palm Beach Gardens, Florida. Fleetwood's commendable 68 was one of only 13 sub-70 scores on the second day at PGA National, with only 10 players of the 144 who started completing 36 holes under par in conditions reminiscent of a traditional US Open set-up. Luke List's 66 was the low score of the day and lifted him into a share of the lead with Jamie Lovemark, while Tiger Woods goes into the weekend just four strokes off the pace and would have been closer to the top two had he not made two late mistakes over the Bear Trap. Rory McIlroy scrambled hard to make the cut despite running up a triple-bogey six at the 17th, the 2012 champion salvaging a 72 to get into the final two rounds with a shot to spare, but defending champion Rickie Fowler crashed out after a wayward 76. List set an impressive early clubhouse target at three under after handing in a superb five-birdie card, his only blemish coming with three holes to play, and Lovemark was the only player to match him as he recovered from two bogeys over his first three holes to post a 69. Despite scoring being even higher in the later groups, Fleetwood shaved two shots off his opening 70 as he stayed composed after an excellent start, dropping birdie putts at the second and fourth before putting together a nice run of pars to turn in 33. A wayward drive from Justin Thomas cracks an unfortunate fan on the head at the Honda Classic. But did he shout 'fore'? The European No 1 picked up another shot when he converted a nice approach to seven feet at the 12th, although he could not keep his card bogey-free as he pulled his approach to the 14th long and left and was unable to get up-and-down. Fleetwood rattled in confident par-saving putts at the next two holes and came within an inch of chipping in for an unlikely birdie at the 17th, and his 25-foot putt for a closing birdie-four pulled up just short as he stayed at two under. The Englishman shares third with Russell Henley, Webb Simpson and South African veteran Rory Sabbatini, while European Ryder Cup star Thomas Pieters dropped two shots over his last six holes to slip to one under alongside Justin Thomas, Daniel Berger and Louis Oosthuizen, who all returned 72s. The vast galleries were treated to some entertaining golf from Woods in the late afternoon, the former world No 1 mixing three birdies with two bogeys and one double-bogey in a creditable 71. Claude Harmon III and Nick Dougherty highlight 'the good, the bad and the ugly' of Tiger Woods' second-round 71 at the Honda Classic. Woods had to take a penalty drop after a pulled drive into trouble at the second, but he got back on track with a birdie at the fourth and got under the card for the tournament with a perfect 25-foot putt for a three at the ninth. The famous Woods fist-pump appeared at the 10th when he holed from 10 feet to save par, but a misjudgement in club selection at the par-three 15th cost him a double-bogey as he failed to carry the water, and another shot went as he three-putted from long range at the next. But a sublime mid-iron to 12 feet at the treacherous 17th was followed by a putt to match, and Woods closed with a cast-iron par at the last to stay well within striking distance at the halfway stage. Overnight joint-leader Alex Noren suddenly looked in danger of missing the cut when he played the first seven holes in five over, although the in-form Swede managed to steady the ship and get round in 75 to stay in a tie for 14th on one over par. Rory McIlroy reflects on another testing day at the Honda Classic after he scrambled hard to make the halfway cut despite firing a two-over 72. Masters champion Sergio Garcia is one further adrift after a battling 70 despite a double-bogey at 17, while US Ryder Cup captain Jim Furyk is also at two over, although he was left to rue late mistakes at 15 and 17. McIlroy started his day with a birdie at the 10th and ground out some valiant pars until blocking his tee shot at the 17th into the hazard before compounding the error by finding sand from the drop zone and taking three more to get down. But the 2012 champion played the front nine in level par with a birdie at six offset by a mistake at the seventh, and he will look to make an early move on Saturday to reel in the leaders seven shots ahead. Fowler will have the weekend to work on his game after missing the cut by two, while Tyrrell Hatton - Fowler's playing partner in the final group on Sunday 12 months ago - also made an early exit after two double-bogeys in his 72.